(1935, Ajax) Harry Carey, Gertie Messinger, Ted Lorch, Phil Dunham, Fred Toones. 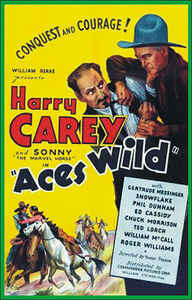 Harry rides into Durango only to find himself involved in a battle of wits with a local bad man. He teams up with the local newspaper editor to bring the crook and his pals to justice. An exciting climax has Harry and the bad guy struggling on a swinging bridge, far above a roaring river. All of Harry’s Ajax films are pretty good. From 16mm.